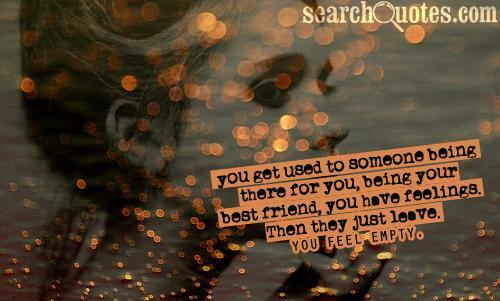 You get used to someone being there for you, being your bestfriend, you have feelings. Then they just leave. You feel empty. When your up, your friends know who you are. When you're down, you know who your friends are. If your having doubts about whether you can actually trust a person...chances are you can't. You can't laugh last if I stab you in the throat with...the knife you left in my back! Don't take for granted every person close to your heart cause you might wake up one day and realized that you've lost a diamond after busy collecting stones. Make new friends but dont forget your old because new is silver and old is gold. A girl's gotta do, what a girl's gotta do...too bad she's gotta do it with someone new. Things change, and so do I. A best friend changes too, I always wonder why. A friendship that ends, never really started.